For some years now, I have a new year rule.Or more like a habit. I use to write down what I intend to do in the year that had just begun. Not once I just misplaced the list and I couldn't remember my new year's resolutions. This year is different. I convinced myself to write everything down and place the list where I can see it all the time.Hope it will work and I will remember. 1. Move in with my boyfriend. 2. Take the driving licence. 3. Take the restauration courses in Venice. 4.Have more architecture and interior designing projects. 7. Love and be loved. 8. Take my blogs to the new level and make them well known. Well,the original list has about 30 things that I plan doing this year, but these are the most important of all.Hope I will be able to achieve all of them, or at least most of them. 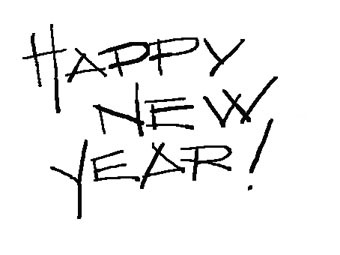 So, I wish you will have a better year and accomplish at least half of your New Year's resolutions.